Indians are now comfortable transacting online – Growth of e-commerce in India over past 2-3 years is a testament to that fact. But there is another vertical that is witnessing a big boom in online transactions – The National and State level e-Governance projects. The live ticker on e-taal (Electronic Transaction Aggregation & Analysis Layer), the government web portal that provides statistics on transactions done electronically by citizens with various e-Governance projects, shows that Indians have done over 2 billion e-transactions in last one year. The amazing aspect of this number is that compared to 2012, this number has increased by a multiple of 100. In 2012, only 21 million e-transactions were registered as compared to 2 billion in 2013. The count is based on 30 government services offered offered electronically by state & government bodies like Tax payments, property registrations, RTI, Passport & Visa services, Company registration, Licenses & Permits, utility services & bill payments etc. When it came to states who did maximum number of e-transactions for procuring Government services, Gujarat took the lead. 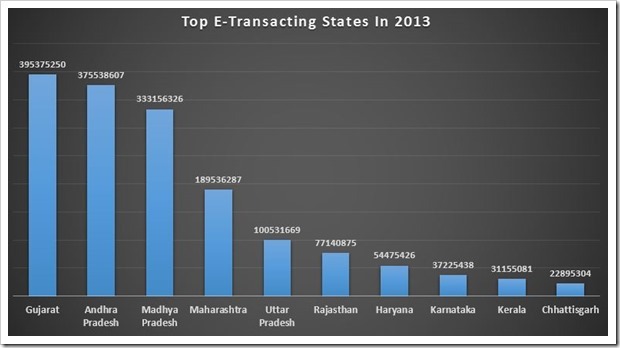 Infact, the top 3 states of Gujarat, Andhra Pradesh and Madhya Pradesh accounted for more than half of all the e-transactions done in 2013, while the Top 5 states accounted for 75 percent of all transactions. It is clear that Gujarat, though being a smaller state compared to likes of Maharashtra, Uttar Pradesh and few others have implemented e-governance very successfully. Out of 2 billion total transactions done in 2013, they alone accounted for nearly 400 million! Among all the services used, Agriculture was by far the biggest one utilized by Indian citizens. Among all the e-transactions, 165 million were from Agriculture sector alone. Telecommunication, Health and CSC were other verticals that witnessed high number of e-transactions. It is pleasant to see that e-transactions are on the rise, however, one needs to keep in mind that India has a population of over 1.25 billion people and 2 billion transactions over a period of 1 year is still very small. Hopefully, in next few years we will see even more exponential growth in e-transactions! Yay! It’s 2014 & Happy New Year To All!